Measure the length of 1mm using a ruler or caliper. In this case, 1mm is magnified to 108.5mm. Then measure the size of the structure on paper. In this case, we look at stomates from the bottom of a leaf. The guard cells are 3.6mm long. Our Biology curriculum in school requires students to be able to calculate the size of cells and other structures from light micrographs, which have a scale bar. It’s probably more interesting for students to actually take the light micrographs themselves. It is not difficult to determine the size of cells and other structures in light micrographs, provided that one has a size standard. It is possible to take a picture of a structure of known size and use this as a basis to calculate the size of other structures. I admit that this is a somewhat improvised method, but it does work for lower magnifications. Place a ruler on the stage and take a picture. A full unit (1 mm) should be visible. Transparent ruler are better, otherwise it’s not possible to see the markings. Take a digital photograph of the ruler. 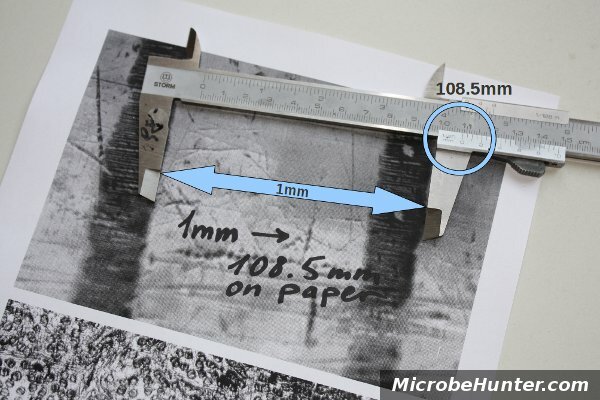 Print the micrograph of the ruler. Take a picture of the specimen. Make sure that you use the same magnification. 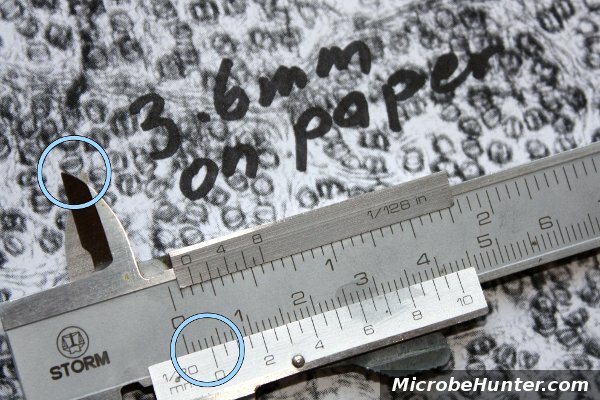 Print the picture of the specimen and be sure that the size of the picture is the same as the size of the picture of the ruler. Do not change the size of the print out. Now it’s time for a little math. Use the ruler and measure out the size of the 1mm on the print out. Measure it out in mm. Let’s call this “r”. Measure out the size of the structure that you want to determine. This is “s”. Make sure that you use the same units (mm)!